Professor Nan Bahr delivers her closing keynote address at the Excellence in Professional Practice Conference (EPPC). Thank you for downloading this podcast, brought to you by Teacher magazine – I’m Rebecca Vukovic. Professor Nan Bahr delivered the closing keynote address at last month’s Excellence in Professional Practice Conference on the Gold Coast. Her keynote, titled ‘Personal attributes: Developing the hidden qualities in quality teaching’ examined the concept of quality in teaching and the personal attributes of teachers that are central to the teacher-learner relationship. In this special episode, we’ll be sharing the highlights from Nan’s keynote address at EPPC. She began her keynote by discussing what makes a ‘quality teacher’. Nan Bahr: I think at the moment we’ve thought a lot about how we build teachers, how we build them to go into the classrooms and how we build them once they’re there. And we try to think about what the elements are that you need to put together to build this teacher. And we think about different sorts of teachers, I mean they’re romanticised in the movies. Teachers that have wonderful qualities and so forth that are transformational. And I think about people in my life that have been transformational to me. It’s hard to imagine, I know, but I was a bit of a difficult child and teachers made the difference really. Mum was taking me off to the doctors to have my head shaved to try and find out what was going wrong in there, if there was anything, but the teachers made a difference in my life and transformed me. Or maybe I was always going to be okay, you never know. But certainly the qualities of a teacher are much more, I think, than the suite of competencies that we list and much more than the things we try to build individually. Rebecca Vukovic: During her keynote, Nan said that when you think about ‘what makes a quality teacher?’ you don’t tend to think of the people who understand government policy or curriculum standards. Rather, you think about the personal attributes of teachers that make a difference to the learner. In this clip, Nan is discussing what she means exactly when she uses the word ‘quality’. NB: This is from [Robert] Pirsig: ‘What I mean and everybody else means by the word “quality” cannot be broken down into subjects and predicates. This is not because quality is so mysterious but because quality is so simple, immediate and direct. This is why quality cannot be defined.’ I think it can be but if we do define it, we’re defining something less than quality itself. So by define, I take it as pulling it apart and looking at the pieces. And that’s what I’d like to challenge in terms of the way we’re working on the development of teachers both pre-service and in-service. But that doesn’t mean that we can’t know what quality is and teachers know, we know, I know – when I think back to Mrs Clarke in Grade 8 and the work she did with me, all she really did was acknowledge me. She said, ‘you’ve got some things to be proud of Nan’ and I thought ‘Really! Holy snappin’ ducks’. It was quite extraordinary really because that had never been, it had always been ‘Nan sit down, Nan shut up, Nan’ … well they never said shut up, you’re not allowed to say that in school, not in the last millennium when I was a child. But certainly, it was an issue. And having somebody validate me and be interested in me, and find something that I was good at meant the world to me as a 12-year-old. It was just unbelievable. And we had a relationship that really was quite productive and I thought it was all about me but she was of course the same with all of the other kids, she found something beautiful about everybody and let them know – and there was a quality about her that was so much beyond her as a competent teacher. It’s not enough to just identify that there are other qualities that are brought to bear because in actual fact being a professional teacher, I believe, is about understanding how these things work with the learning, with the outcomes that you desire. It’s not just a matter of having particular qualities and picking people that have them and saying ‘in you go into the classroom’ – there’s a professional element to it that we’ll go into. …So we have professional standards, here they are, 37 of them, there’s not a single one of them that I wouldn’t want to have, not a single one. I’ve been part of the picture of creating them. I mean, we quibble about the words don’t we? This word is better than that word – but really, every bit of it needs to be there. But it’s still not enough because that’s a list of competencies. RV: Some of the issues discussed in this keynote are also explored in great detail in Nan’s monograph in the Australian Education Review. In this clip, Nan discusses the way the community views teachers and explores why the work of teachers is sometimes thought of as ‘invisible’. NB: Part of the story that I discuss in that monograph, is that, as you’re well aware, much of the work that teachers do is invisible. People don’t understand it, there’s a naïve community view that just responds to basically the ideas they’ve formed around teachers from having been students for decades. They’ve seen teachers do things and they think teachers question, plan … they know all that stuff but they actually don’t understand all those other elements. So we’ve got the personal attributes but we’ve also got that broader stuff around teaching that needs to be understood as well. That is, teachers have a very good understanding of policy, of curriculum, of how they can present information, and how they can be made accountable. They understand their communities in terms of who the students are, who’s in their class, what the watermark is of their school, they understand the cultural importance, the gender issues ­­– there’s a whole host of knowledge and understanding that sits behind someone’s performance that we pick up in those lists of competencies. So we’ve got the competencies, then we’ve got the broader wealth of worldly knowledge that we have that is a professional knowledge about the field. So there’s an issue about how we’ve been defining quality teaching and I think that what we’re looking for is something that picks up on the ripples, the enduring impact that teachers have on the lives of learners. What is that? There’s an essence in quality teaching that’s added to all of those other components that makes the difference. Unfortunately, though, what we tend to do is we use proxy measures of quality. We look at student outcomes and we say, ‘well that must be a quality teacher because look at the student outcomes’ – well that’s part of the picture as I say. We say, ‘well the teacher has a lot of experience so therefore it’s a quality teacher’. We talk about the teacher’s qualifications and say that because they’re highly qualified, we’ve got quality. They’re proxy measures and that’s probably because it’s hard to measure the sorts of qualities I’m talking about. RV: In this section of the keynote, Nan talks about Paul Witty’s 1947 research into the 12 personality traits of an effective teacher. NB: Even children as young as six are able to articulate attributes for teacher quality better than we seem to be able to. Witty, now I’m going again back to last century, 1947 now, this time I wasn’t alive. He asked 12 000 Grade 2 kids to talk about the attributes and characteristics of a teacher who has helped them most. And they cited these things and they’re going to be in rank order so this is the first thing. (So there’s a kid writing on the board, she likes doing that). Cooperative/democratic attitude – I suspect somebody has turned the kids’ words into something we understand a bit better, but anyway, that’s how it was interpreted. I’d go back … I don’t even know if Witty is still around but that was certainly number one on the list that apparently came from these kids. Kindliness – now that’s a word that might come from kids because I’ve never heard of it before. Kindliness and consideration for the individual. Patience. Wide interests – you need wide interests don’t you because your kids have all got wide interests and you need to be able to go up to a kid and say something about horses, and this one, something about dance, and that one you need to be talking about how important it is to have the right colour shoelaces these days. There’s so many different things. This one people get a bit upset about, personal appearance and pleasing manner, but the kids came up with it and I think it’s a thing actually. We’re finding with pre-service teachers, if they don’t look like they care for themselves, that’s an issue and if they don’t have a pleasing manner, it’s an issue. Fairness and impartiality; sense of humour; a good disposition and consistent behaviour; interest in the pupil’s problems; flexibility; use of recognition and praise – now this is what Mrs Clarke did for me, she praised me, I probably didn’t deserve it but gee it made me feel good. And then they still think you need to be proficient in your teaching areas. 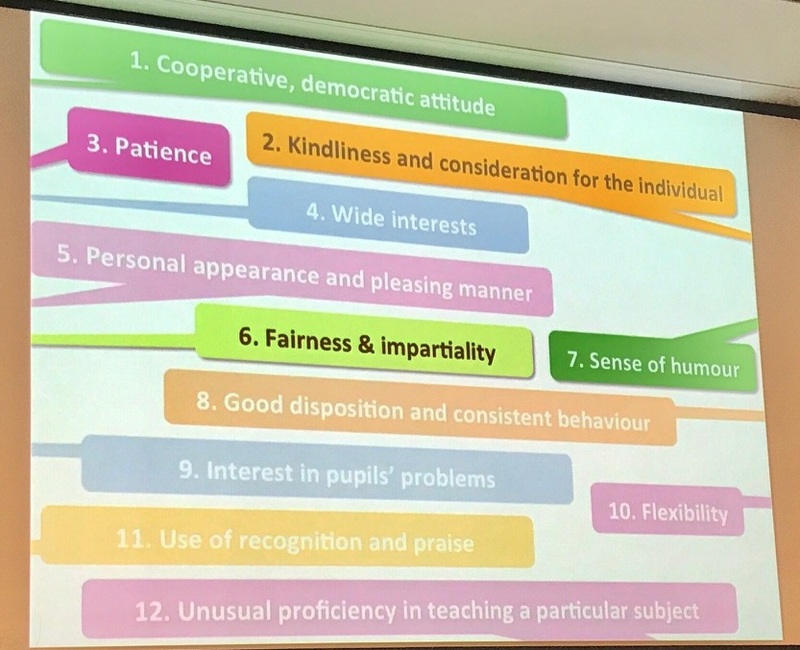 But what I’m saying is these kids identify them as qualities, but I’m saying they need to be professionalised. It’s not enough to just have these lovely things, and in my monograph I picked up on those ones. RV: Now, this is where Nan dives a little deeper to explore some of these attributes in greater detail. NB: What about kindliness and consideration for the individual, again, I think that’s a professional skill. That’s about differentiated learning but it’s about differentiating the way you relate to students, it’s not just about figuring out how the content ought to be packaged to meet the needs of a particular learner, their understanding and so forth, it’s about how you are and the relationship that you establish with those kids and you need to understand a whole range of things to be able to do that well. The professional knowledge of kids with ADHD, the professional knowledge that you might have of kids that are struggling with outside issues with home structures and so forth. You bring professional knowledge to the way you engage as a kind person and your kindness is shown in the way that you expect students to perform on tasks. Fairness and impartiality – being fair is not being the same, as you’re aware. So thinking about how fairness plays into the relationship between curriculum, pedagogy and assessment, it’s no good having an assessment that’s not an authentic reflection of what the kids have learnt and the way that they’ve practised it. You know, that’s being fair. It’s a professional framework. And sense of humour, well people have senses of humour and there are people who have got a good sense of humour but you wouldn’t want them teaching for a number of reasons. What I’m talking about, I’ve had some fantastic teachers with a really good sense of humour and what they’ve been able to do is make a learning moment come to life by finding the funny. And by using funny and humour in a way to break the mood for students. It’s a professional skill! And how you do that is really quite a nuanced thing. You need to be really professionally well-groomed to use it well. RV: To conclude her address, Nan summarises the range of competencies that we need to develop and implement in our roles as teachers. NB: It’s not just competencies. They’re in there but it’s not enough. It’s not just the knowledge and the worldly characteristics. It’s not just that purpose for teaching because we’ve picked out how to assess people with the right appropriate purposes. The thing that makes a difference between someone that’s okay and adequate as a teacher and someone who is the best teacher for a child to set them up for the rest of their life as a learner, is one that can bring to bear their personal qualities in a professional way. And I think we have an obligation as a community of professionals to shine a light on that and find ways of actually developing it because I think they’re things that can be taught and developed and shown and demonstrated and modelled. Some of those things you only learn vicariously by watching other people. That’s all for this special episode. To keep listening or to download all of our podcasts for free, visit acer.ac/teacheritunes or www.soundcloud.com/teacher-ACER. To access the latest articles, videos and infographics from Teacher visit www.teachermagazine.com.au. Consider how you use humour in your classroom? Have you had an instance where you’ve been able to use humour to bring a learning moment to life? Nan Bahr encourages educators to think about how fairness plays into the relationship between curriculum, pedagogy and assessment. For example, do you design assessments that are an authentic reflection of what the students have learned or practised?